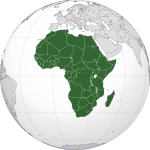 Niger, also called the Niger ( /ˈnaɪdʒər/, or /niːˈʒɛər/; French: [niʒɛʁ]) officially the Republic of the Niger, is a landlocked country in Western Africa named after the Niger River. 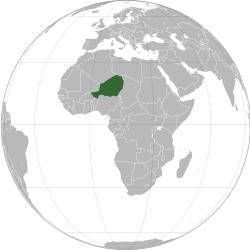 Niger is bordered by Libya to the northeast, Chad to the east, Nigeria and Benin to the south, Burkina Faso and Mali to the west, and Algeria to the northwest. Niger covers a land area of almost 1,270,000 km2 (490,000 sq mi), making it the largest country in West Africa. Over 80% of its land area lies in the Sahara Desert. The country's predominantly Islamic population of about 21 million mostly clusters in the far south and west of the country. 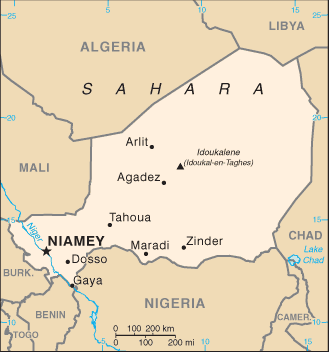 The capital city is Niamey, located in Niger’s southwest corner. Niger is a developing country, consistently ranks near the bottom in the United Nations' Human Development Index (HDI); it was ranked 187th of 188 countries for 2015. Much of the non-desert portions of the country are threatened by periodic drought and desertification. The economy is concentrated around subsistence, with some export agriculture in the more fertile south, and export of raw materials, especially uranium ore. Niger faces serious challenges to development due to its landlocked position, desert terrain, inefficient agriculture, high fertility rates without birth control, and the resulting overpopulation, the poor educational level and the poverty of its people, the lack of infrastructure, the poor health care, and the environmental degradation. Nigerien society reflects a diversity drawn from the long independent histories of its several ethnic groups and regions and their relatively short period living in a single state. Historically, what is now Niger has been on the fringes of several large states. 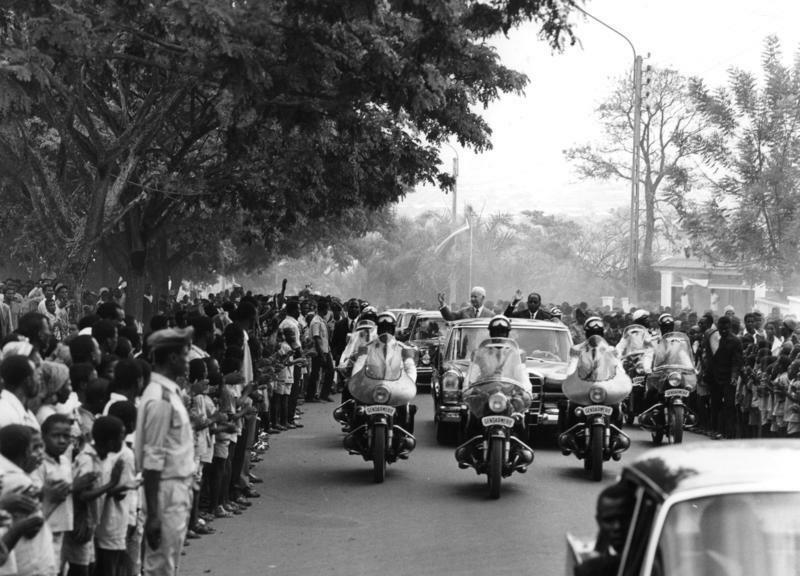 Since independence, Nigeriens have lived under five constitutions and three periods of military rule. After the military coup in 2010, Niger became a democratic, multi-party state. A majority of the population lives in rural areas, and have little access to advanced education. As of 2015, 71.3% of Niger’s population cannot read, one of the lowest literacy rates in the world. By at least the 5th century BCE, Niger had become an area of trans-Saharan trade, led by the Berber tribes from the north, who used camels as a well-adapted means of transportation through the desert. This trade made Agadez a pivotal place of the trans-Saharan trade. This mobility, which would continue in waves for several centuries, was accompanied with further migration to the south and interbreeding between southern black and northern white populations. It was also aided by the introduction of Islam to the region at the end of the 7th century. 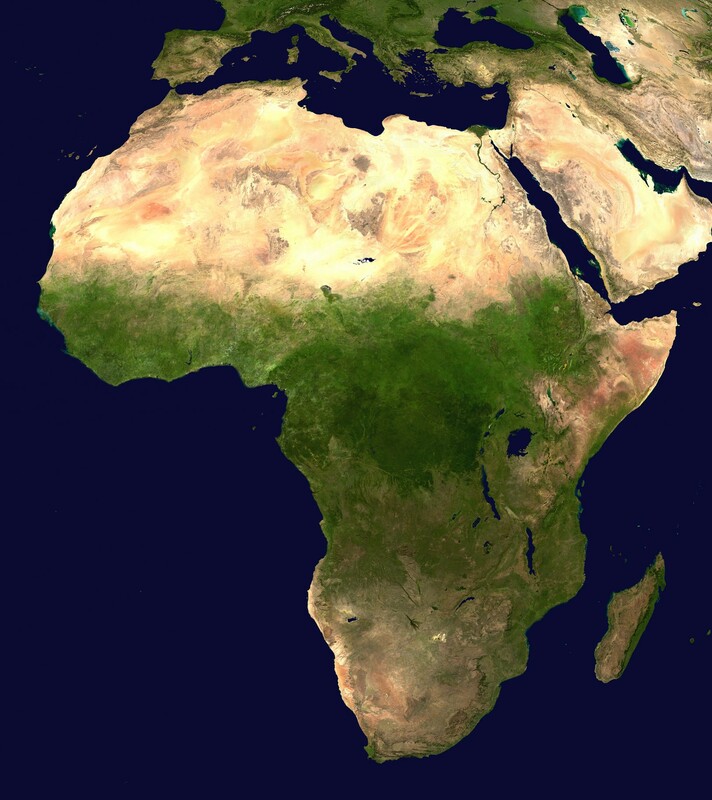 Several empires and kingdoms also flourished during this era, up to the beginning of colonization in Africa. In addition to uranium, exploitable deposits of gold are known to exist in Niger in the region between the Niger River and the border with Burkina Faso. In 2004, the first Nigerien gold ingot was produced from the Samira Hill Gold Mine, in Tera Department. The Samira Hill Gold Mine thus became the first commercial gold production in the country. The reserves at the location were estimated at 10,073,626 tons at an average grade of 2.21 grams (0.078 oz) per ton from which 19,200 kilograms (42,000 lb) will be recovered over a six-year mine life. Other gold deposits are believed to be in nearby areas known as the "Samira Horizon", which is located between Gotheye and Ouallam. As of 2016, the population of Niger was 20,672,987. Expanding from a population of 1.7 million in 1960, Niger's population has rapidly increased with a current growth rate of 3.3% (7.1 children per mother). Niger has a wide variety of ethnic groups as in most West African countries. The ethnic makeup of Niger is as follows: Hausa (53.0%), Zarma-Sonrai (21.2%), Tuareg (10.4%), Fula (French: Peuls; Template:Lang-ff) (9.9%), Kanuri Manga (4.4%), Tubu (0.4%), Arab (0.3%), Gourmantche (0.3%), other (0.2%). Niger is a secular country and separation of state and religion is guaranteed by Articles 3 and 175 of the 2010 Constitution, which dictate that future amendments or revisions may not modify the secular nature of the republic of Niger. Religious freedom is protected by Article 30 of the same constitution. Islam, widespread in the region since the 10th century, has greatly shaped the culture and mores of the people of Niger. Islam is the most dominant religion, practiced by 80% of the population. Approximately 59 percent of Muslims in Niger are Sunni, 7 percent are Shi'a, 5% are Ahmadiyya and 20% Non-denominational. Islam was spread into what is now Niger beginning in the 15th century, by both the expansion of the Songhai Empire in the west, and the influence of the Trans-Saharan trade traveling from the Maghreb and Egypt. Tuareg expansion from the north, culminating in their seizure of the far eastern oases from the Kanem-Bornu Empire in the 17th centuries, spread distinctively Berber practices. ^ "Nigerien – definition of Nigerien in English from the Oxford Dictionaries". https://en.oxforddictionaries.com/definition/nigerien. Retrieved 1 March 2018. ^ a b "Human Development Report 2016". United Nations Development Programme. 2016. p. 25. http://hdr.undp.org/sites/default/files/HDR2016_EN_Overview_Web.pdf. Retrieved 4 January 2018. ^ a b "ISO 3166". ISO Online Browsing Platform. https://www.iso.org/obp/ui/#iso:code:3166:NE. Retrieved 12 May 2017. ^ a b "UNGEGN World Geographical Names". United Nations Statisticsc Division. 1 March 2017. https://unstats.un.org/unsd/geoinfo/geonames/. Retrieved 12 May 2017. ^ "Population Explosion". The Economist. 16 Aug 2014. https://www.economist.com/news/middle-east-and-africa/21612239-runaway-birth-rates-are-disaster-population-explosion. Retrieved 3 August 2015. ^ a b Decalo, Samuel (1997). Historical Dictionary of the Niger (3rd ed.). Boston & Folkestone: Scarecrow Press. ISBN 0-8108-3136-8. ^ "Abdourahmane Idrissa, Samuel Decalo" (2012). 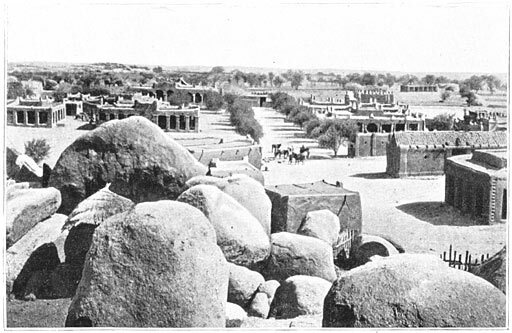 "Historical Dictionary of Niger". "Scarecrow Press". 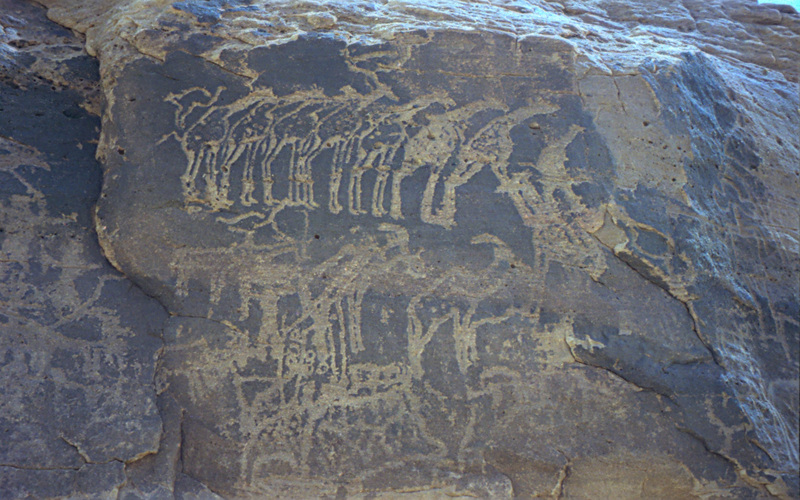 p. 421. ^ Publications, USA International Business (2007) (in en). Niger Foreign Policy and Government Guide. Int'l Business Publications. ISBN 9781433036873. https://books.google.ca/books?id=gwInUH18i8wC&pg=PA28&lpg=PA28&dq=The+niger+agreed+to+absorb+some+of+the+former+rebels+into+the+military+and,+with+French+assistance,+to+help+others+return+to+a+productive+civilian+life.&source=bl&ots=RqsgKXIDqT&sig=gcaZwF0S_92s8WlZgEcauTjpTf0&hl=en&sa=X&ved=0ahUKEwiR4KaFrN7YAhVM62MKHeX4D2MQ6AEIKTAA#v=onepage&q=The%20niger%20agreed%20to%20absorb%20some%20of%20the%20former%20rebels%20into%20the%20military%20and%2C%20with%20French%20assistance%2C%20to%20help%20others%20return%20to%20a%20productive%20civilian%20life.&f=false. ^ "Africa – Niger leader dissolves parliament". Al Jazeera English. 26 May 2009. http://english.aljazeera.net/news/africa/2009/05/2009526174440137316.html. Retrieved 3 May 2010. ^ a b c d e f g h Background Notes for Niger: January 2009 Bureau of African Affairs, United States State Department. Retrieved 26 February 2009. Portions of the "Economy" section are here used verbatim, as this document is in the public domain. ^ a b "UPDATE 3-Areva signs uranium deal with Niger, delays new mine". Reuters. http://uk.reuters.com/article/2014/05/26/areva-niger-idUKL6N0OC2TB20140526. Retrieved 7 February 2015. ^ a b "Niger sets new terms in uranium ore deal with Areva". DW.DE. http://www.dw.de/niger-sets-new-terms-in-uranium-ore-deal-with-areva/a-17667618. Retrieved 7 February 2015. ^ "– Coal Production and Utilization 2007–2011 Report P218". http://www.stat-niger.org/statistique/file/Annuaires_Statistiques/INS_2012/AS2007-2011INDUSTRIEEXT.pdf. ^ report by 3D → Trade – Human Rights – Equitable Economy, on Agriculture trade liberalization and women's rights. ^ "BBC World Service | Slavery Today". BBC. http://www.bbc.co.uk/worldservice/specials/1357_slavery_today/page3.shtml. Retrieved 3 May 2010. ^ "Religion in Niger". National Institut of Statistic of Niger. http://www.stat-niger.org/statistique/file/Annuaires_Statistiques/Annuaire_ins_2011/Niger%20en%20chiffres%20nov%202011.pdf. Retrieved 24 June 2014. ^ "Niger". Association of Religion Data Archives. http://www.thearda.com/internationalData/countries/Country_165_2.asp. Retrieved 3 November 2012. ^ a b International Religious Freedom Report 2007: Niger. United States Bureau of Democracy, Human Rights and Labor (14 September 2007). This article incorporates text from this source, which is in the public domain. ^ Summary for Shedrack Best's Nigeria, The Islamist Challenge, the Nigerian 'Shiite' Movement, 1999 Script error; conflict-prevention.net. ^ Imam, Ayesha M. Dossier 17: The Muslim Religious Right ('Fundamentalists') and Sexuality Script error. WLUML, November 1997. ^ "The World Factbook". Cia.gov. https://www.cia.gov/library/publications/the-world-factbook/geos/ng.html. Retrieved 25 April 2014. ^ a b c d e f "Niger" Script error. 2001 Findings on the Worst Forms of Child Labor. Bureau of International Labor Affairs, U.S. Department of Labor (2002). This article incorporates text from this source, which is in the public domain. ^ Green, Jeff (10 May 2006). "U.S. has second worst newborn death rate in modern world, report says". CNN. http://www.cnn.com/2006/HEALTH/parenting/05/08/mothers.index/index.html. Retrieved 3 May 2010. ^ "The World Factbook". Cia.gov. https://www.cia.gov/library/publications/the-world-factbook/rankorder/2127rank.html. Retrieved 25 April 2014. ^ "The World Factbook". Cia.gov. https://www.cia.gov/library/publications/the-world-factbook/rankorder/2223rank.html?countryName=Niger&countryCode=ng&regionCode=afr&rank=11#ng. Retrieved 25 April 2014. ^ "Niger". Archived from the original on 23 November 2011. https://web.archive.org/web/20111123142319/http://www.angellite.org.uk/where-we-work.html. Retrieved 20 May 2012. ^ "At a glance: Niger". Archived from the original on 30 November 2009. https://web.archive.org/web/20091130170853/http://www.unicef.org/infobycountry/Niger_statistics.html. Retrieved 2007-06-22. ^ Media in Niger: the African Development Information Database Script error. ^ Medias Status Report: Niger Script error. Summary document written for the African Media Partners Network. Guy-Michel Boluvi, Les Echos du Sahel Niamey, January 2001. ^ Niger : Conseil de presse. Les journalistes refusent la mise sous tutelle Script error. Ousseini Issa. Médi@ctions n°37, Institut PANOS Afrique de l'Ouest. March 2004. ^ Niger: Emergency legislation infringes non-derogable human rights Script error. AMNESTY INTERNATIONAL Public Statement. AI Index: AFR 43/001/2007 (Public Document) Press Service Number: 181/07. 21 September 2007. US State Department "Niger". State.gov. 3 February 2010. https://www.state.gov/r/pa/ei/bgn/5474.htm. Retrieved 3 May 2010. Note: This article contains material from the State Department website. This page uses content from the English language Wikipedia. The original content was at Niger. The list of authors can be seen in the page history. As with this Familypedia wiki, the content of Wikipedia is available under the Creative Commons License.